At the March 9 Commission meeting, highlights include approval of an extension of a Strategic Partnership with the ECE Registry and an update on Home Visiting collaboration with Los Angeles County. The Board voted to extend its strategic partnership with the Child Care Alliance of Los Angeles and continue to support the California Early Care and Education Workforce Registry Coalition, illustrating First 5 LA’s commitment to continuously improving how California recruits, retains, supports and compensates quality teachers and caregivers of our youngest children. The action allocates up to $2 million for up to 3 years, which will be leveraged with funding from the San Francisco Office of Early Care and Education (SF OECE) and First 5 Santa Clara County to support Registry operations, data systems development and system alignment. Registries improve the quality of early care and education services by promoting the professional development of the workforce, creating a mechanism for collaboration between various early childhood systems (e.g., the department of education, licensing officials and resources and referral agencies), and providing data and information to inform early education policy change. More than 40 U.S. states have similar registries, many of which are administered as part of licensing or Quality Rating and Improvement Systems (QRIS) through state departments of education or early learning. Currently, California does not have a statewide early care and education registry, but several counties, including Los Angeles, are working in partnership on this shared registry effort. Read more here. Vice President of Programs Christina Altmayer and Director of Family Supports Barbara Andrade DuBransky presented the Board with a framework on the work by First 5 LA and countywide partners to build an integrated system of home visitation in Los Angeles County. This effort was recently given “rocket fuel” in December when the L.A. County Board of Supervisors passed a motion by Supervisors Sheila Kuehl and Janice Hahn to direct the Department of Public Health, in partnership with several county departments, the Los Angeles County Perinatal and Early Childhood Home Visiting Consortium, the Office of Child Protection and First 5 LA to develop a plan to coordinate, enhance, expand and advocate for high quality home visiting programs to serve more expectant and parenting families so that children are healthy, safe and ready to learn. 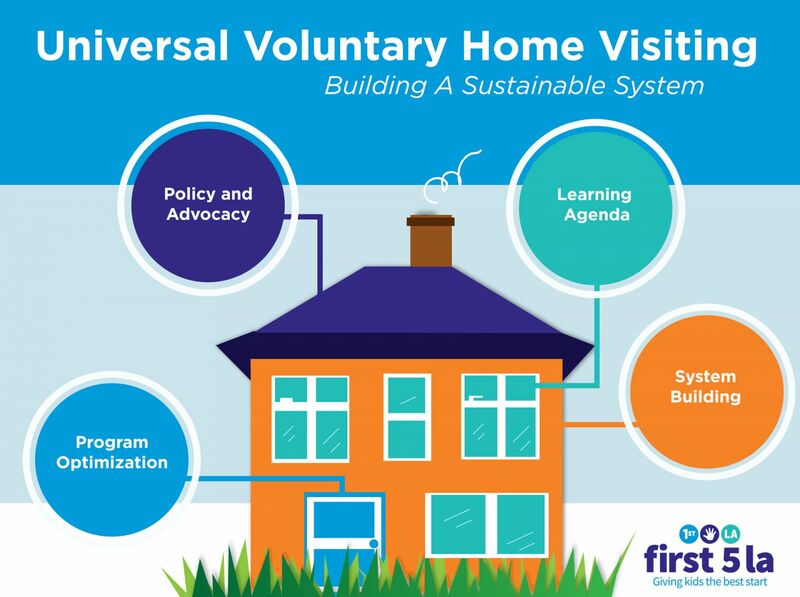 In an analogy, DuBransky likened home visiting to a house, with its structural components represented by systems building (walls), program optimization (a door), a learning agenda (windows) and policy and advocacy (roof). In each of these areas, DuBranksy discussed various issues First 5 LA, the Consortium and various county partners are examining together, including: intake and referral; when families can enroll; communication; program accessibility, fidelity, quality and cost; and workforce quality. Additionally, DuBranksy said that First 5 LA is working with its home visiting partners to support the upcoming Office of Child Protection Prevention Plan; strengthen the Consortium; strengthen evaluation capacities and common data; advocate for reauthorization of federal home visiting funding and potential expansion and effectively utilize and maximize countywide resources invested in home visiting. Future updates on this important work will be made at the Program and Planning Committee meetings in May and June.